Ask any girl with curls what her favorite thing about her hair is, and nine times out of 10 she will tell you that it's the versatility. Given the right styling tools and products, she can wear her hair curly, straight, braided-out, twisted, and everything in between. And yet, there is one area that many curlies rarely dare to venture into: bang territory. It’s true, a vast majority of the bangs we see in the media are straight, swooping side-bangs or blunt fringes — looks that can’t be easily achieved on curly hair without the near-daily use of a flat iron or a round brush. But, that does not mean this haircut is impossible. There are just a few things you need to know before you take the plunge. Shrinkage is that all-too-familiar phenomenon of curly hair appearing much shorter than it really is. When curly hair is wet or straightened, it may reach halfway down your back; but, when in its natural state, it might barely touch the shoulders. As a result, at some point you have probably walked out of a salon with hair much shorter than you bargained for. It happens to the best of us, and it's important to know that bangs are even more susceptible to this shortening effect. To help ensure you get a cut you're happy with, bangs and all, go to a stylist who either has curly hair or who is very experienced working with it — that way you won’t end up with accidental Beyoncé baby bangs. We know that it can be very daunting to entrust your curls to someone, but in this instance, it's probably a wise move. Curly hair expert and Devachan founder Lorraine Massey says, “In my experience with curly hair, any sort of a fringe (bang) can potentially lead to frizz and extreme shrinkage. It’s best that you get another set of eyes on your curls to help determine how they might react.” This is not the time for you to try out your scissor skills for the first time. Once a stylist has given you the initial cut and shape, you can learn to trim your bangs at home. But, leave the first cut to the professionals, please. As I said before, curly hair can be stretched, straightened, twisted, or worn natural, so you have plenty of options when it comes to styling. Before you get bangs, be realistic about your habits. It’s easy to say, “I can blowdry them every morning.” But, if you have a five-minute morning routine right now, then it's unrealistic to think that you'll suddenly be willing to add on a lot more time to style your new 'do. Fortunately, curly bangs look gorgeous framing the face, which requires little hands-on styling time. And, curly hair is often thicker than straight hair and can hold a style easily, so when you’re short on styling time, a twist and a few bobby pins will keep those bangs up and out of your face all day long. 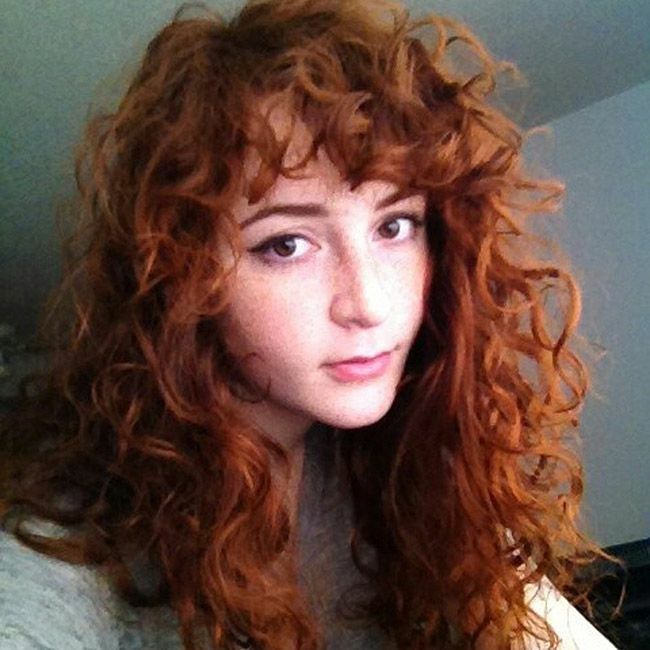 NaturallyCurly’s Nikki Johnson has Type 3 curls and recently cut bangs herself (yes, against our advice). But, she has found plenty of ways to style them. If you have Type 4 coily hair, watch Ambrosia Malbrough on YouTube for inspiration. So, in case it's not clear: Yes, curly haired women can absolutely pull off bangs. And, remember, no matter what happens, hair grows back, so if you're not completely satisfied with your cut the first week, you might just love it once it's had some time to settle in.